Cutler Bay Movers – Many people feel overwhelmed by the the prospect of moving. With over fifteen years of experience in and around the area, Discount South Florida Movers can handle all of your moving needs at the best rates in town. Our team of friendly professionals will treat your items with absolute care while they quickly perform the move. There’s no part of the move that we can’t do for you. Our experts can provide assistance no matter what the details of your move are. Whether you need flexible hours and need to move nights and weekends or you have items like pianos, we will take care of your needs. Whatever you may need done, we have a team of experts that can assist you. 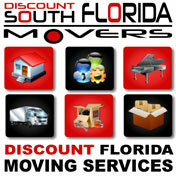 Whether you are moving down the street or across the state, you can trust Discount South Florida Movers to help. Cutler Bay is a fairly new town, incorporated in just 2005. Located in the south portion of Miami-Dade County, this town of 44,000 is known for being in the path of Hurricane Andrew. In 1992 it made landfall in the vicinity and was at the time the most destructive natural disaster in America’s history. The recovery effort led to the creation of the town 13 years later. It is also famous for a coral formation. The coral starts from Miami and goes through it. It can reach 22 feet in places. The College of Business and Technology has a campus in the city. The town is along the Florida East Coast Railway. The town was originally settled as a post to supply homesteaders during the land boom. Just 180 years later, they would incorporate into what it is called now. Discount South Florida and Cutler Bay movers provide low rates on residential, commercial, piano and long distance moving.